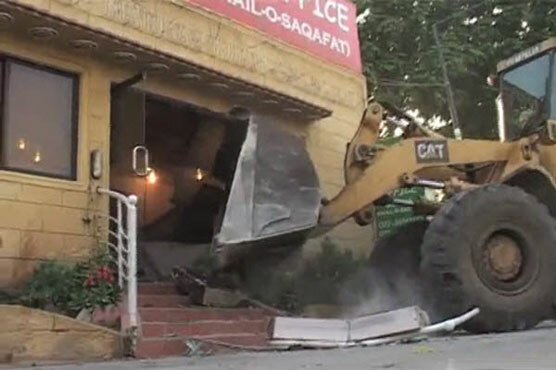 KARACHI: The Karachi Development Authority’s (KDA) anti-encroachment operation continued on the sixth day on Saturday as more marriage halls ‘illegally’ built on amenity plots in the city were razed to the ground. According to the KDA officials, they faced resistance while demolishing the reportedly illegally constructed marriage halls. They added the authorities also received threats from those involved in encroaching the amenity land. However, the officials said, they would not come under any pressure during their drive against structures illegally constructed on amenity plots. The marriage hall called Lalazar, in Gulshan-e-Iqbal area of Karachi, was being demolished over orders by the Supreme Court, KDA officials said. Another such structure, Sara Lawn, was also razed to the ground. Sara Lawn, situated on University Road in Gulshan-e-Iqbal, was demolished earlier, however since it was being reconstructed, KDA teams had to take action again. According to the additional director of KDA, they will file cases against owners who were getting their demolished buildings reconstructed illegally. He added orders from the apex court would be followed at all costs. On the other hand, the municipal commissioner of Korangi and Landhi has written to the director general of KDA against marriage halls constructed on 17 amenity plots in their areas. According to the authorities concerned, marriage halls have been constructed in their areas through china-cutting, it is a practice in which plots allocated for public amenities are sliced to construct commercial and residential properties that are sold off for huge profits. Therefore, they have demanded action be taken against land mafia.